Despite continuous proclamations of its impending death, email is still the top digital marketing channel in terms of both profit and popularity. According to the Data & Marketing Association’s (DMA) annual benchmark report, email was the top profit generator in 2017 with a cost-per-acquisition (CPA) of only $10.32. Social media, website chat, the explosion of audio and video–email has, and continues to, outperform these channels. This is why HubSpot, and other automation software products, have seen sky-high adoption rates and market valuations for the better part of the past decade. They’ve taken the power and effectiveness provided by your standard email service provider (ESP) and integrated with all of the channels that drive acquisition–blogging, social media, paid media, landing pages, etc. 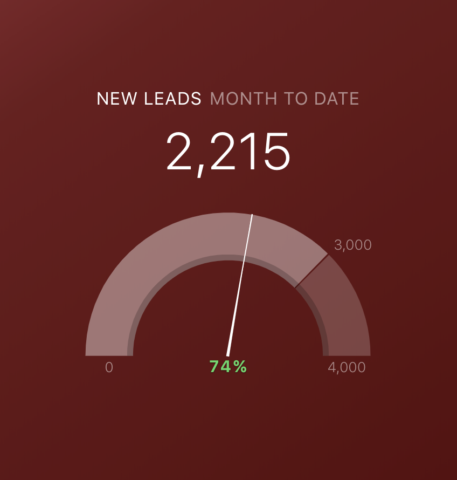 Acquisition: How many new leads did we generate? 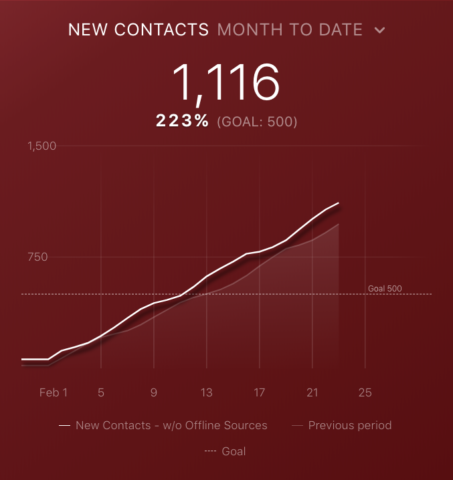 Which channels are driving new contacts? Qualification: How many of my leads are qualified for marketing and/or sales? Segmentation: How are my different segments of qualified leads growing? Marketing and sales: How many people are clicking our emails? How many new customers did we generate? 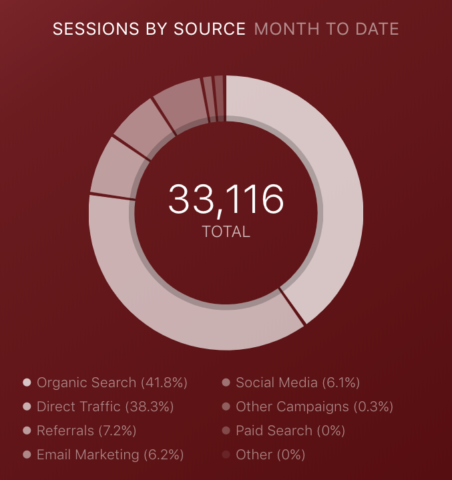 While you’ll notice the obligatory metrics like “Sessions” and “Sessions by Source,” the most-tracked HubSpot metrics are largely focused on building and executing an effective email marketing strategy. 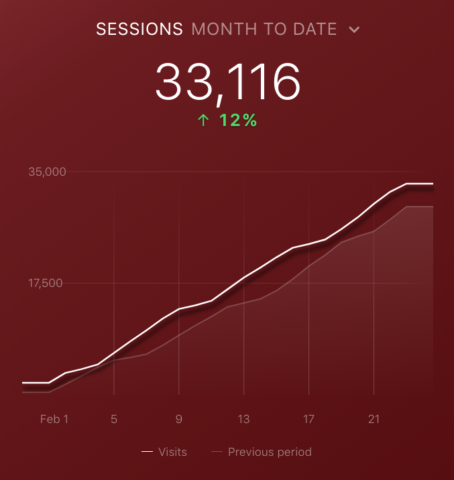 To get a handle on how marketers prefer to visualize these metrics, I talked to some prolific users of both HubSpot and Databox. *All the data included in the screenshots below is sample data and not reflective of any user and/or client data. A Datablock is one block of data that, along with any number of other Datablocks, make up a single dashboard. 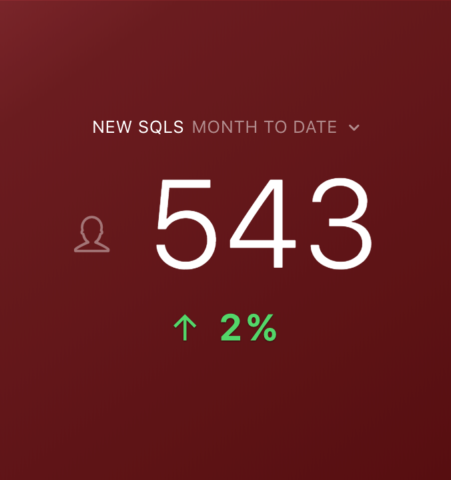 They’re customizable, resizable, and many of them are pre-configured so that all users need to do is drag and drop them to their dashboard to quickly visualize data. Recommended Datablock: Line graph with comparisons turned on. – Sean Henri, Pepperland Marketing. “Being able to spot the ups and downs in our traffic helps us detect and correct emerging problems early, while the trendline helps ensure that we’re moving in the right direction,” said Henri. This metric calculates the number of new contacts, or email addresses, generated during a specific time frame. 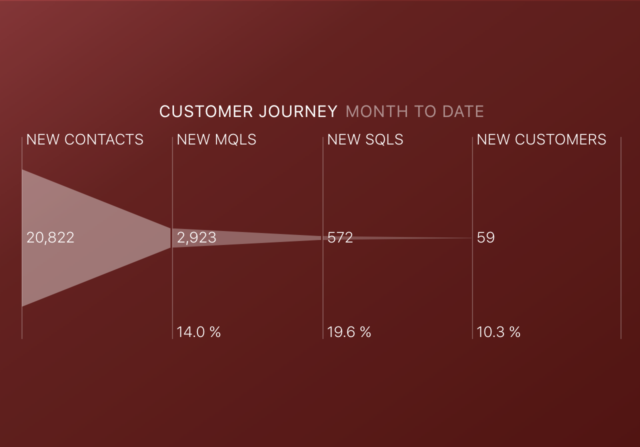 According to our study, most users opt to exclude offline sources from their reporting, which stays consistent further down the funnel for “New Customers” as well. Recommended Datablock: Line chart, cumulative, with comparisons and goals turned on. – Sean Henri, Pepperland Marketing. HubSpot breaks down website traffic into the various sources that drive people to your site, i.e. organic search, email, social media, direct, etc. It’s worth noting that HubSpot’s verbiage of “sources” differs slightly from Google Analytics’ “Sessions by Channel”, however, both metrics are comparable. Recommended Datablock: Pie chart. – Jonathan Stanis, Weidert Group. HubSpot allows users to organize their leads according to the stage of the buying cycle they’re in. As a result, the criteria for this metric will vary greatly depending on the user and/or organization using HubSpot. Marketing qualified leads (MQLs) often refer to leads that are qualified according to a set of criteria specified by the user. Due to their level of qualification, these leads are typically nurtured with more marketing material in order to work them further down the sales funnel. Recommended Datablock: Progress Bar with goals turned on. – Chris Handy, ClosedWon. 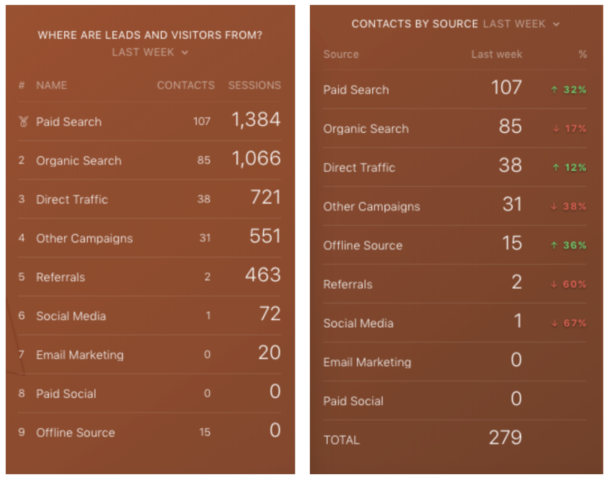 New contacts by source track the specific sources (organic search, email, social media, direct, etc.) 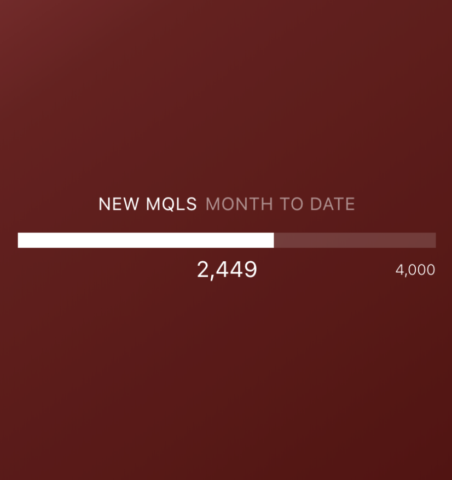 generating new contacts during a specific time period. Recommended Datablock(s): Leaderboard for leads and visits by source, Table for contacts by source. – Chris Handy, ClosedWon. New customers track the number of customers whose first conversion occurred during a specific time frame. Recommended Datablock: Funnel – Chris Handy, ClosedWon. Like MQLs, Sales Qualified Leads (SQLs) are organized based on specific user criteria and usually denote leads that are ready to be engaged by sales. Recommended Datablock: Number with comparisons turned on. – Sandy Moore, Smartbug Media. While “Contacts” denote any new email address added to the database, “New Leads” is a measure of where these contacts fall in the lead lifecycle stage. Recommended Datablock: Gauge with goals turned on. – Chris Handy, ClosedWon. HubSpot users can organize their leads according to any contact or company property they’re tracking in HubSpot. This can be anything from a contact’s geolocation, to the number of times they’ve visited specific pages, the specific emails they opened and/or clicked, etc. Users pull together “smart lists” based on the properties they’ve chosen to isolate. “Contacts by Smart List” is simply the total number of contacts in one specific smart list. Recommended Datablock: Progress Bar – Chris Handy, ClosedWon. “We create interest tags that can be automatically applied to a contact in HubSpot when a prospect visits a certain feature page ‘X’ number of times,” said Handy. 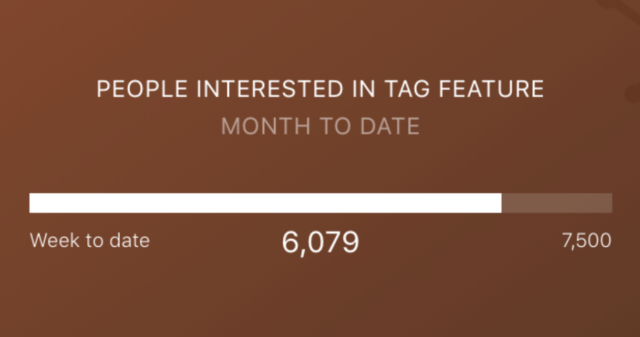 “This progress bar is a smart list based on who has that interest tag. Note that when you add a goal, it really does its job. The number of times email, sent through HubSpot, were clicked during a specific time period. 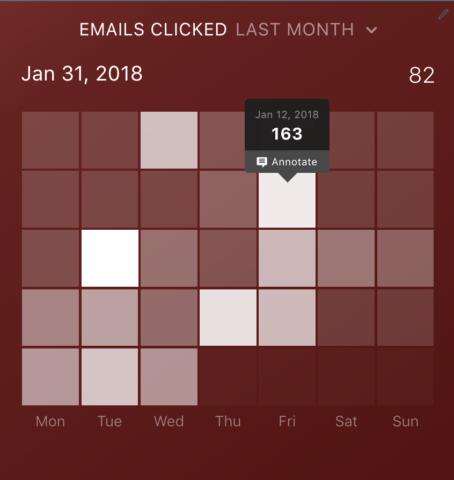 Recommended Datablock: Calendar Heatmap. – Chris Handy, ClosedWon. 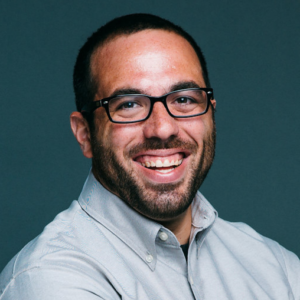 Want to easily track all of these HubSpot Marketing metrics in one place? Download our free template and get started visualizing your data within minutes. Want to see even more free HubSpot Marketing templates? Here’s a gallery of HubSpot-specific templates created by some of the most prolific users of the software in the space.